We recently had an opportunity to try out the Pale Horse Dynamic Overdrive by VFE Pedals. The Pale Horse is a very versatile overdrive – taking something common but providing some great options to find the tone/settings for yourself. It can clean up and give you a bit of hair… or rip your face off. The Pale Horse started as an electrical theory. How could the most widely used & copied overdrive pedal in history be improved? The answer has led to so many changes & improvements that the Pale Horse is really a unique overdrive pedal that is unlike any other. The Pale Horse is so smooth, transparent, and dynamic, more than a few have reported that it sounds as good or better than their own amp’s distortion, all by itself. Use it on the clean channel to create a foot-switchable “channel B”, or push an already overdriven amp into sonic nirvana. High Cut: Adjusts the high end. Helps with smoothing out the bite. A-L-M: This a mode switch which allows you to select the clipping optin. A=1by3 asymmetrical diode clipping, L=5mm Red LED clipping and M: MOSFET clipping. The Asymmetrical clipping uses 1N4002 silicon diode, 1N914 silicon diode and a 1N60 germanium diode. There are 2 internal trim pots. Impedance control and Frequency control. Again for this demo, I asked my good friend Jimmy Rolle to play some guitar. Jimmy is playing a Gibson Les Paul Elegant Custom Shop guitar through a Rivera Knucklehead 100 head on top of a Marshall 4×12 cabinet loaded with Vintage 30s. We recorded the demos with a Shure SM57 microphone and a Cascade Fathead II-SP Ribbon microphone into a ART Pro MPAII PreAmp. VFE Pedals is a company out of Washington state making some great pedals and offering custom work. Peter (owner of VFE) is building some great, high quality pedals, but at a very affordable price. 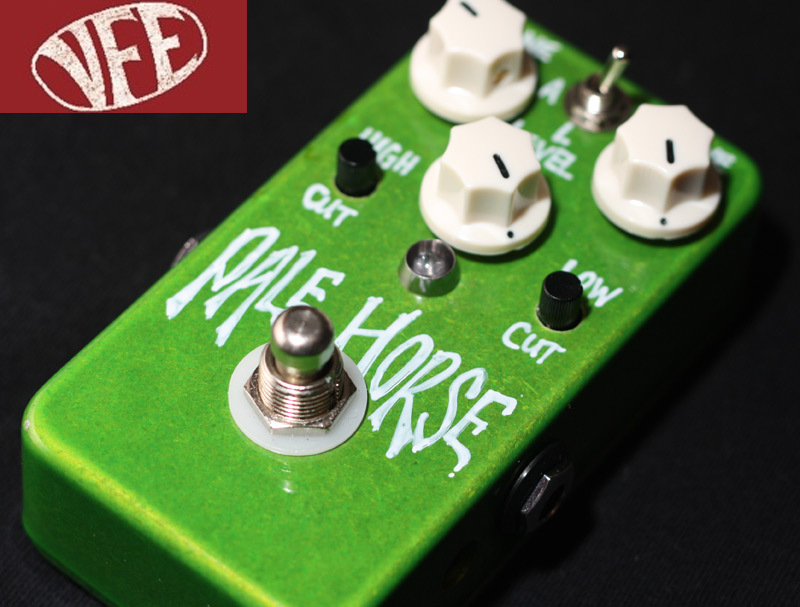 The VFE Pale Horse can be yours for only $140! To me, this is a bargain for the versatility and quality of this pedal. If you’re interested in picking up a new overdrive, keep the Pale Horse in mind. You can learn more about VFE Pedals at their site (and they are also on Facebook). Overall, as mentioned, the pedal is extremely versatile with lots of tonal options. It provides a great set of overdrive tones for various styles of music and playing. The pedal cleans up very nicely with volume roll offs. The High cut and Low cut pots are a great selling point, and puts this overdrive in a position to stand above many overdrive pedals out there. – What sets apart VFE from other builders? 1) I believe in the creativity of musicians over the creativity of the designer. This is why my pedals have so many controls! I could make a pedal with the standard 3-knob layout, but then I would have to make choices about the tone of the pedal that I believe should be left to the player. I know I could build some simpler, killer-sounding pedals, but that would pigeonhole the player to the range of tones I like. I am not opposed to building simpler pedals at some point, but it will have to be for a good reason! I am also tired of all the boutique knock-offs of established circuits that don’t offer anything new. Many of my designs are based on classic circuits, but I hope that it’s obvious that I don’t just build clones. 2) I want the whole experience to be good for all in every possible way. My highest priority is that the pedal sounds great & is built to last. But I also want the customer to have good information, helpful & timely service that allows them to get the most out of each pedal & make the best initial buying decision for their needs. Even though I build all the pedals by hand myself, I don’t charge the kind of inflated prices that the boutique market is known for. Now that I am at the beginning stages of entering the retail market, I want to make the experience good for the retailer, as well. I went around to many local independent shops here in the Seattle area, and asked lots of questions about different industry practices. I got some great feedback, which has allowed me to develop policies & practices that have become lost in this modern business age. I have put lots of time into the website, and plan to add much more over the coming months, to make it an even better resource for those who already own my pedals, those who are interested in getting one, and those DIYers who are looking for new ideas to try for themselves. I actively pursue ideas that can help make my business & this industry better, because I’d rather have a good name than loads of cash. 3) I am a relentless perfectionist. Many of my designs have undergone several revisions, not because they sounded bad, but because I can’t settle for anything less than perfect. Most of the revisions offer minor tweaks, but there is the occasional larger change, as well. I can get nothing but praise over a certain design, yet I still find something that I want to tweak with. I don’t worry about making changes to even my best-selling pedals, because I’d rather make the best pedal I can than sit on an old design just because it sells well. 4) I don’t keep secrets about my designs. No goop, no subjective claims without objective explanations. I am so confident that no one can build a better pedal for a better price, that I actually answer questions about the circuit design, and what parts & part values I use. I plan to eventually put a schematic (minus the part values) of each pedal up on the website. I don’t need people to get caught up in a bunch of hype, then stoke that fire by pretending it’s some unique design when it’s really just another tube screamer with 2-3 mods & a fancy paint job, then charge $350 for something that cost me $40 in parts. You know who I’m talking about. – When designing the Pale Horse, what were you primary objectives? The simplest way I can think to describe my objective with the Pale Horse is that I wanted an overdrive that could help any guitarist, with any guitar, amp, other gear, and playing style, to be able to dial in a smooth overdrive tone that feels & sounds just right for them. So it obviously had to flexible EQ options, but I think that’s only part of the solution. Some players like more sustain, compression & drive, and others like more dynamic control & mild breakup…but I think all players like a pedal that can do both without having to reach down & change the controls. So then it had to have a huge gain range, but also more headroom before compression/distortion. The tone & feel of the drive character was something that I experimented on the most, because that part of the pedal can make a HUGE impact on the character of the overdrive. I finally arrived on the combination of filtering caps & clipping elements that I felt hit the key overdrive tones. The A mode uses 4 diodes in a 1 x 3 setup (one silicon 1N4002, and one silicon 1N914 + germanium 1N60P + silicon 1N914). This configuration brought out more even harmonics, and because it has a lower clipping threshold than the other two modes, more overall distortion, compression & sustain. The L mode used 5mm red LEDs & the smallest value filtering cap, for a crunchier & more biting tone. Finally, my favorite mode is the M position, which uses the actually saturation of mosfet transistors to generate the distortion. This type of clipping has a really high threshold, so it’s the most open & dynamic, and retains its clarity even when you slam the DRIVE control. – What type of guitarist would be interested in the Pale Horse? Honestly, there isn’t a guitarist that I wouldn’t at least recommend the Pale Horse too. I know that’s not very specific, but I really do believe that the Pale Horse is up to that broad task. I should say that the most common use my customers have written me about is as a 2nd channel for their amp. Several customers have really loved using the Pale Horse this way, as it allows them to keep the character they love about their guitar/amp relationship, but with more drive & sustain. – Is the Pale Horse the flagship pedal of VFE? If not, what is? If I had to pick just one of my pedals, it would be the Pale Horse, so I guess you could call it my flagship pedal. It’s the one I have spent the most amount of time designing. My first pedal design was essentially the first version of the Pale Horse (it was called the Proto OD), although much has changed since then! I think the current version is either the 7th or 8th version of that first circuit. I really worked to get that transparent, versatile, smooth & dynamic overdrive that is so loved by guitarists. While the Pale Horse has an insane amount of gain for an overdrive (66dB at max), I use clipping elements with much higher thresholds than standard overdrive pedals. This choice made it possible to to get some good compression & drive, while still cleaning up with your picking & the volume knob. The high clipping threshold also necessitated more internal headroom, so the Pale Horse uses a simple voltage inverter circuit to power the pedal with close to double the input voltage (it can handle up to 15V). – What got you into building pedals? I majored in math, minored in physics, and I started playing the electric guitar…so it was something that naturally merged all my passions & skills together! It all started when I got G.A.S. & started buying lots of different pedals, and then found & bought some kits from Build Your Own Clone in March 2008. They send you a “confidence booster” to let you build something simple before trying anything else, in case you are afraid that you won’t be able to do it. Well, my confidence booster didn’t work…but I went ahead & build a much more complicated pedal on my next attempt (Lazy Sprocket). At first I learned about simple mods on the forums, then began to learn about some of the simpler electronic audio concepts (op amp gain, filters, voltage dividers, etc), and kept on moving from there. I probably learn something new every week in this job, and that’s why many of my pedals have undergone several design revisions. Even when a pedal sounds amazing, I still try to find ways to make it better. – Can you tell me a little more about the switching mechanism? How did you address the ‘pop’ with true bypass? As I wrote earlier, that is still something I strive to improve. Right now I use a latching relay switching system designed by Jack Deville electronics. The relay switching opens up some options for players with more sophisticated switching/looper systems, custom multi-effect pedals & even rack-mounted custom builds. The relay switch operates at 5V, which does help to minimize the pop (the magnetic field produced by the inductor is less prone to induce a charge on the switch contacts at lower voltages), so it’s a little quieter than the boutique industry-standard mechanical switching. Jack Deville actually makes a great switching system that can be purchased after-market. I decided not to use his system for two primary reasons. First, I would have to use his circuit board design, which won’t work with my need to build both flexible & compact pedals. Second, it would have added about $15-20 to the end cost for my customers. I do have some ideas that I continue to test to see how to make the switching as quiet as possible. I don’t want to discuss these yet, as I don’t want to build hype over something I haven’t yet designed! However, one trick I employ now is to use a low-pass filter + series resistor in front of the LED. This simple circuit both allows the player to tweak the brightness of the LED via an internal trimpot, but it also makes the LED ramp on/off. This quick ramp softens the abrupt current strain on the power supply, and in many cases, helps reduce the amount of pop produced by the circuit. – What new circuit are you working on currently (if not secret)? I’m finishing up with the last tweaks of a new design for the Blueprint delay. It should give more tonal flexibility, but at the same time be simpler to tweak the tone of the delay via one internal trimpot. The other designs I am working on is the Driver EQ buffer + EQ, Choral Reef chorus, and Galaxy Star flanger. The latest information on these effects is up on the website, and I will post more as I get closer to finalizing the circuits. The design that is probably closest to done out of these three is the Driver EQ, which features a class A, discrete differential JFET buffer/booster (try saying that 10 times fast! ), plus an active 3-band EQ. While it shares some similar features to the Rocket EQ, it doesn’t have the Q & frequency controls of the mid-band, and has less overall boost on tap. The Driver EQ instead has a variable impedance control, and an EQ on/off switch for those tone purists. – What’s with the ‘horse’ naming scheme? My brother & I thought it would be a good idea to develop quintessential effects for the major tone pedal families — overdrive, distortion, fuzz, and compressor. While each of the horse series pedals are very versatile, their primary range of tones is designed to nail everything we love about each genre of pedal. Transparency & smooth breakup in an overdrive, hard-edge bite in a distortion, super-saturated sustain in a fuzz, and dynamic control & clean sustain in a compressor. The names were my brother’s idea, and choosing which name went to which pedal was easy. The 4 horses are a reference to the 4 horsemen of the apocalypse found in the Bible. The White, Dark, and Fiery Red choices seemed pretty natural choices for clean compressor, distortion, and fuzz pedals. It actually took a little word search to see that the “Pale Horse” really did fit the title for the overdrive best. Let’s see if this logic makes sense. The design of the TS808 tubescreamer is certainly the most copied & modified overdrive ever, and it was green. But the word translated “pale” in the Bible is also the word for “green”, especially a sickly green hue. So while the Pale Horse is not a TS808 clone, it is in the same general family, hence the green color & Pale Horse name. – What does VFE stand for? VFE stands for “VonRutter Family Effects”. The name was born of a family joke, when my entire family (5 kids + parents), who are not the best singers, did a little song routine & dubbed ourselves the VonRutter Family Singers. It’s a name I then used for my E-mail address & eBay account several years ago, and it was how the earliest buyers referred to my “brand” before VFE officially existed, simply because that was the name of my eBay account. Electro-Harmonix Bass BLOGGER Distortion Overdrive pedalMusician's Friend Accessory Sale! I want one of these, it literally has my name on it. Is that a dumb reason to pick this OD over the VFE Scream?